He was famous across the globe for his brilliant escape acts. 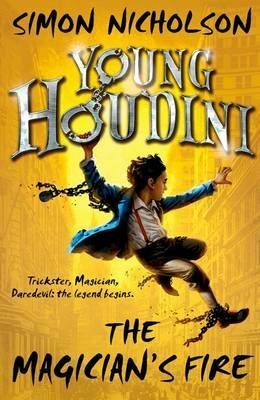 But before he became the great magician, who was young Harry Houdini? In 1880s New York, Harry Houdini is just a shoe-shine boy dabbling with a few escape tricks. But when a well-known magician is kidnapped, Harry and his friends must race across Manhattan to track down the villains! The world's most famous magician. But before his name became legend, who was young Harry Houdini? New York City, 1886. Harry Houdini is just a penniless street urchin dabbling with a few escape tricks. But when a well-known magician goes missing in mysterious circumstances, Harry and his friends, Arthur and Billie, are sucked into a deadly adventure. Now Harry must put all his extraordinary skills into action - not just to solve the mystery - but to stay alive. Because when he falls into the clutches of some of Manhattan's most dangerous villains, his spectacular escapes won't be for show - they'll be a matter of life and death!